Shipping notice received yesterday evening for my Darklands: Metal Age force! Thuulac looks cool but I have nothing to go with him. Apart from that none of the monsters arr gripping me and I'm not sure if I want anything already produced just yet. It's another Mierceday and we have some awesome stuff for you this time. But then, don't we always? This week we have more from Bob Plociennik, for the Brythoniaid! We can't wait to see these guys in the flesh! The last warrior of the unit, is Dudd ap Rudd... unless you count Cob ap Mab, the alternate banner bearer. It's a mighty tome for sure, very pretty. And it smells nice too! Come on Mr Postie. Where's my book! Things are progressing nicely on the Darklands: Savage Hordes project, because we have another update for you this week and it's blimmin' awesome, even if we do say so ourselves. It's also very ratty! a list of what ships, when;[*]...and anything else you can expect from us over the next few months. We've some lovely ratties for the Vras to show this week, courtesy of Benoît Cosse! To say that we love Benoît's work on the Spear-Vras is the biggest understatement of the century... we want to cuddle them so much it hurts! The champion of the unit is No-Claw - named after his missing right hand of course! The herald of the unit is Fat-Skin, a drummer of some note. A warrior of the unit, is Sharp-Fang, and a runner! A dasher! Run-run! Or it could be dance-dance... who knows? has the first post gone missing? EDIT : Nope for some reason I'd set it to ignore! Never has a man been set on ignore less, surely! Wonder how the "grass" will be sculpted onto it? If they can pull that off convincingly it will look incredible! I love the concept. He literally is a walking, angry mountain! I was thinking of sprucing mine up with some grass tufts. He's gonna be a big boy! So was I reading the KS correct, and the prices of the larger resins are rising? I guess they've been static for a few years, so probably time. A good way of looking at it! I was initially only so-so on the Érainn, but the more I see, the more I like! And yes, while it is mostly only in my mind, I see them as the closest thing to the 'good guys' (sorta, more or less) in the Darklands setting! Bear in mind that the recommended retail price of most of the monsters listed here will increase shortly, so you're getting a fantastic deal. £10,000 - We're Funded! Thank You! Amazingly, we're funded already - that is some going everyone. Well done! The project is now a reality - give yourselves a pat on the back! Has Banbrega got people in his rib cage? He does - how awesome is that? I was hoping there would be one of those $60 starter things in this, as the minis look nice, but on the bright side saving moneys always good. Maybe the next kickstarter. Well,what a fine thing to wake up to! Wow - Looks like Mórannach has got a unit of his own to lead now! 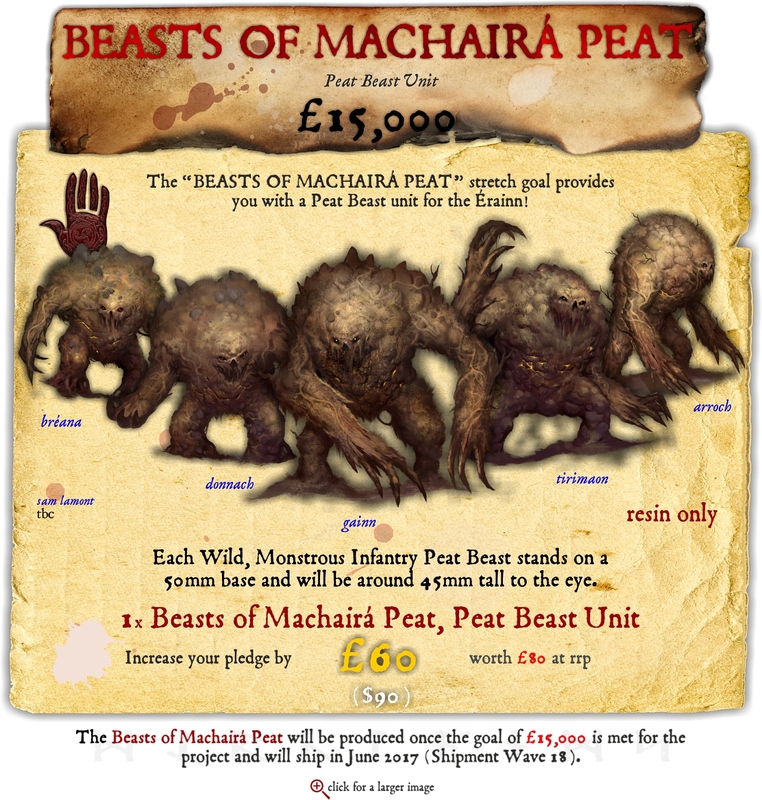 Good to see that this unit can count as one of the 5 in the Five Monsters deal too! Are you guys getting any notification that your rulebook has shipped either through the carrier or via MM's site? Yep, received a dispatch email and book arrived 2 days later.